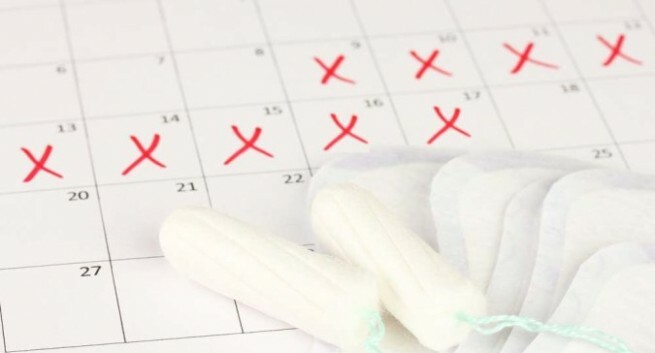 If your period won't stop and lasts for more than 10 days, it can be caused by various conditions. Medical treatment may be necessary to deal with it. Most women pass approximately 40 mL of blood in a three to seven day span during their period. The actual length and heaviness of the flow will vary from woman to woman, but the symptoms associated with their period should remain constant from month to month. The timing between periods (around 21 to 35 days) should also remain constant if the menstrual cycle is healthy. However, sometimes, your period may be abnormal, making you ask questions like "why my period won't stop". Well, many women have experienced this condition in which women have prolonged bleeding that lasts longer than the average menstrual cycle. Some women may suffer from chronic bleeding for more than six months. Let's find more facts about it. Prolonged bleeding can be shown by a number of symptoms. Those who note these symptoms occurring may need to see a doctor to help alleviate their distress. Excessive bleeding at night - You may find yourself needing to wake up at night to change your pad in order to avoid leaking. Requiring double protection - Patients may not be able to control their flow with one tampon or sanitary pad. You may find yourself wearing one of each or wearing two pads to attempt to control the bleeding. Soaking through your protection quickly - You may need to change your tampon or pad more than once in an hour because they have been soaked through. Prolonged bleeding - Bleeding lasts for longer than one week when you reach your menstrual cycle. Anemia - Constant bleeding or heavy bleeding can leave the body starved for iron. Anemia can also cause shortness of breath, fatigue or make you tire easily. Restriction of daily activities - You may find that you do not have the energy to complete your daily schedule. You may also need to limit your activities to manage the bleeding without leaks. Passing blood clots - As you change your sanitary pad, you may notice several large clots in the blood. Pain - You may suffer from dysmenorrhea, or excessively painful cramping that limit your ability to move as easily during your menstrual cycle. A number of conditions listed below can contribute to an abnormal menstrual cycle. Your doctor can perform an examination or tests that will help you determine which may be causing your discomfort. Adenomyosis - This is caused by glands in the endometrium becoming embedded in the muscles of the uterus, which is more common in middle aged women who have experienced childbirth. Cancer - Uterine, cervical and ovarian cancer can cause excessive or irregular bleeding to occur. Dysfunction of the ovaries - If the ovaries are not functioning properly, it can cause a decrease in progesterone levels, leading to heavy bleeding. Hormonal imbalance - The hormones that help balance and control your menstrual cycle are not at the right levels to maintain healthy bleeding. Inherited bleeding disorders - Coagulation disorders that alter the blood clotting mechanisms in the body can lead to abnormal periods. Intrauterine device (IUD) - Excessive menstrual bleeding can be caused by the insertion or management of an IUD. Medications - Medications that increase your risk of bleeding can also have an impact on the menstrual cycle. Polyps - Small growths on the lining of the uterus typically occur during reproductive age, causing excessively high hormone levels. Pregnancy complications - If the heavy bleeding suddenly begins or occurs only once, it can be a sign that you are suffering from an ectopic pregnancy or miscarriage. Uterine fibroids - Tumors on the uterus appearing during childbearing years can increase the severity of your menstrual cycle. Other risk factors that could lead you to ask quetion "why my period won't stop" include thyroid problems, liver disease, kidney disease, pelvic inflammatory disease or endometriosis. If you are dealing with irregular vaginal bleeding, bleeding that occurs after you have experienced menopause or bleeding that is so severe that it soaks through your tampon or pad in less than an hour, you will need to seek medical help. This is particularly important if your heavy bleeding lasts for several hours at a time that make you ask "what can I do if my period won't stop". Medications - Medications are frequently used to help managed periods that are not acting the way they should. First your doctor will perform a test to ensure that there are no underlying conditions that could be contributing to your condition. You may need antibiotics to clear up an infection that is causing your body to bleed excessively. Prostaglandin inhibitors are often used to help manage your menstrual cycle more effectively. If you have been using birth control, you may need to switch your prescription. Those not using contraceptives are frequently given birth control to help regulate their menstrual cycle effectively. Surgery - In the event of a severe condition, you may require surgery to eliminate your discomfort. One of the most common procedures is a dilatation and curettage or D&C. This allows the doctor to dilate the cervix and gently scrape away the lining. You may also need to have surgery to remove fibroids, polyps, an ectopic pregnancy or tumors. In extreme situations, a hysterectomy may be necessary to treat a serious underlying disease such as a cancer that can be causing your abnormal or excessive bleeding.